Dr. Nils Johnson completed his undergraduate degree at the University of British Columbia in Vancouver, Canada, and earned his medical degree from Columbia University Vagelos College of Physicians and Surgeons in New York, New York. He then completed his internal medicine residency and fellowships in cardiology and interventional cardiology at the Northwestern University Feinberg School of Medicine in Chicago, Illinois. In addition, he also received a Master of Science degree in epidemiology and biostatistics from the Department of Preventive Medicine at Northwestern. 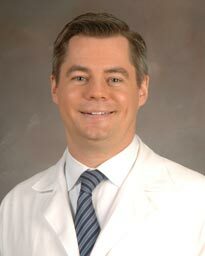 Board certified in internal medicine, cardiovascular disease, interventional Cardiology and nuclear cardiology, Dr. Johnson hasclinical interests that include determining when invasive cardiac catheterization, angioplasty (stent), or bypass surgery are necessary by using non-invasive tools like cardiac PET imaging or invasive tools like FFR and CFR. His research with mentor Dr. Kenneth Lance Gould started in 1999 and focuses on clinical coronary physiology, from perfusion imaging to intracoronary hemodynamics. During the 2015-16 academic year, he spent a sabbatical emphasizing invasive coronary physiology with Dr. Nico Pijls at the Catharina Hospital in Eindhoven, Netherlands. Dr. Johnson served as the principal investigator for international trials in coronary physiology like CONTRAST (NCT02184117) and DEFINE-FLOW (NCT02328820). He lectures worldwide and has published numerous academic articles.